Event | The phrases "driving pleasure" and "saving fuel" seem to be complete opposites. Fully enjoying a car simply costs a bit more fuel. Shell wanted to prove pleasure and efficiency can be a match during the Eco-Marathon 2010, which was held from 5 to 7 May 2010 in Berlin. The most efficient drivers from Europe took part in an economy-run for the grand prize: a super frugal Volkswagen Golf BlueMotion. Teams of students went one step further and built their own extremely efficient vehicles. The rules of the "Shell FuelSave 1 Litre Challenge" are simple: the one that can cover the longest distance on one litre of fuel is the winner. But before the games begin, the Australians, John and Helen Taylor, coach the competitors. Together this happy couple hold 88 world records and say they can double the official factory consumption figures of any car. More than inspired, and with 20 tips from the professionals, the competitors head for the checkered flag. The challenge is more than just driving around until the car runs out of fuel. Even at the starting line the competitors have to answer a question about saving fuel. If they give the wrong answer, they have to turn on the air conditioning for the first four laps. They will never forget tip #1 ever again: use the air con as sparingly as possible, since it consumes a lot of power. After four laps the Taylors wait for the drivers at an improvised fruit stand along the track. The competitors have to repeat twelve of the Taylor's twenty tips for saving fuel. Failing to do so, means taking on board 10 kg of potatoes. It is a cruel reminder of tip #2: try to save weight. A few laps later the "school run" awaits. Again the competitors have to answer a question (How does Shell FuelSave improve gas mileage?). Whoever answers incorrectly has to take on two children (dolls) on board and return them after two laps. Shell FuelSave is supposed to improve gas mileage by keeping the valves cleaner, which makes the engine run more efficiently. Of course the school run violates another rule of efficient driving: only use the car for long distances. All day long the competitors show their skills while the Golfs move surrealistically slowly around the track. Some contestants release the accelerator so far ahead of each corner, that they barely meet the average speed of 30 km/h. Others opt for a higher, constant pace and a more fluent driving style. At the end of the day the proud winner of the brand new Volkswagen Golf BlueMotion is the German driving instructor Gunter Grossler. He drove significantly faster than the other contestants, thereby utilising the optimal engine speed in top gear. Grossler will use his new Golf as an instruction vehicle. 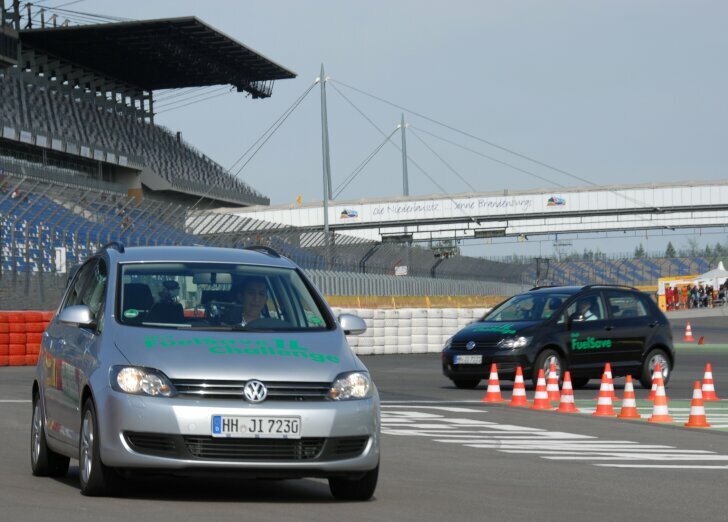 Those who take driving lessons from "Fahrschule Grossler", will have the honour of being instructed by the official "Smartest driver of Europe". Grossler was victorious by driving 22.8 km on one litre of petrol (64 mpg). For the teams of students this isn't efficient enough by far. 213 teams from 22 countries built their own extremely frugal vehicles. They compete in two categories: "Prototypes" and "Urban Concepts". The prototypes are streamlined vehicles in which the driver lies down. The urban concepts resemble traditional cars; they have headlights and even a boot. 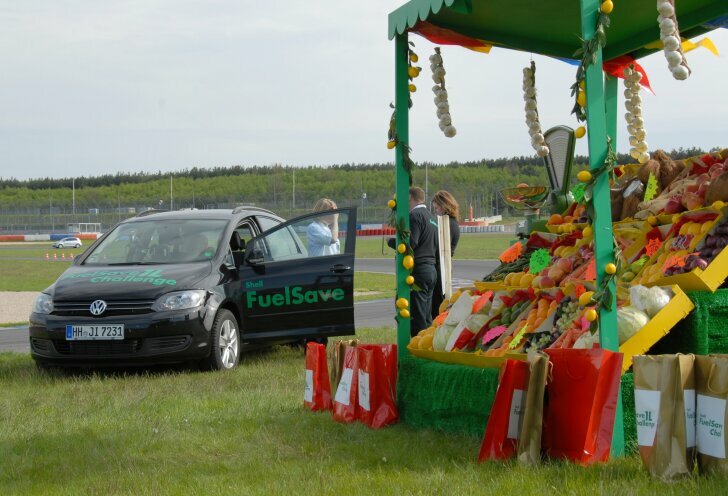 All vehicles are free to choose from a range of fuels: petrol, diesel, hydrogen, bio-ethanol or solar power. Compared to a high speed race, the race of the prototypes and urban concepts is an unusual sight. No roaring engines can be heard from the paddock and to break the silence Shell plays some music over the PA system, something that would normally be futile. Pit boxes aren't closed to hide trade secrets, but instead are open for both guests and the competitions. Tips, and even car parts, are freely exchanged amongst the teams. On the stands the experience is different as well. Most vehicles glide by almost inaudibly. At the most the modest cough of a 50 cc engine can be heard, which after reaching the desired cruising speed is quickly turned off again. The creatively designed urban concepts are especially loved and cheered on by the spectators. For example, there is a bamboo car, a tiny Renault Megane and even a lookalike Ferrari. The audience's favourite is without a doubt the imitation Citroën 2CV (far right on the panoramic photo), which pays homage to the 60th birthday of this iconic car. The winner of the urban concepts class is a Dutch team. On their third attempt the "Hydro Cruisers" (#402) travelled 747 km on one litre of hydrogen. The French "Polyjoule" prototype covered an amazing 4,896 km on one litre of fuel, breaking a world record. By comparison: the number two "only" did 2,965 km per litre. Three teams built solar powered cars, they drove an average of 600 km per kilowatt-hour. 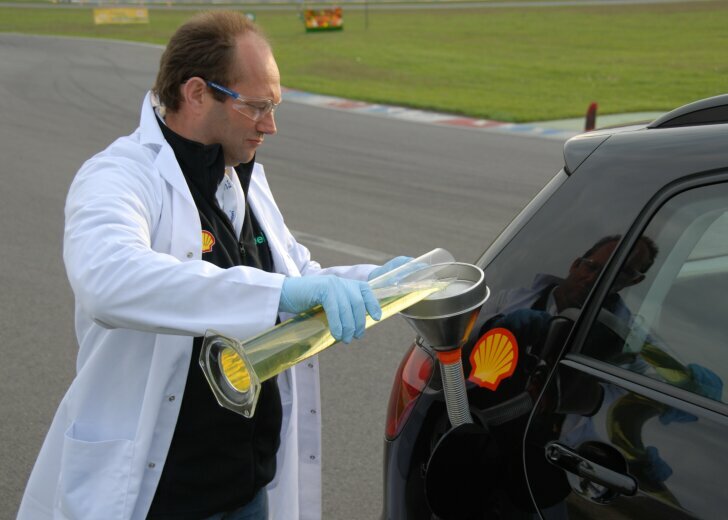 Recently German racing driver Christina Surer started working as the "FuelSave Ambassador" for Shell. After three days of saving every drop of fuel, she summarised the event as follows: "Racing at high speed is mainly about basic instincts. Saving fuel on the other hand is also about strategy, making it even more of a challenge". The Shell Eco-Marathon started out in 1939 as a bet between two scientists who both claimed they could travel the farthest of one litre of fuel. 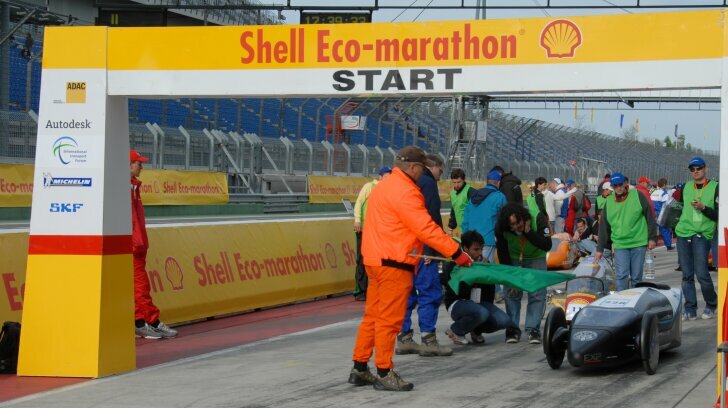 In 2010 the Eco-Marathon is a worldwide event attracting hundreds of student teams. The Eco-Marathon isn't about fame and glory, but mostly an intellectual challenge. Building extremely efficient, innovative vehicles is a learning experience for the students, while coming together in Berlin is a true delight. On top of that, driving as efficiently as possible is a very exciting challenge. It isn't just about car control, it also requires strategy. 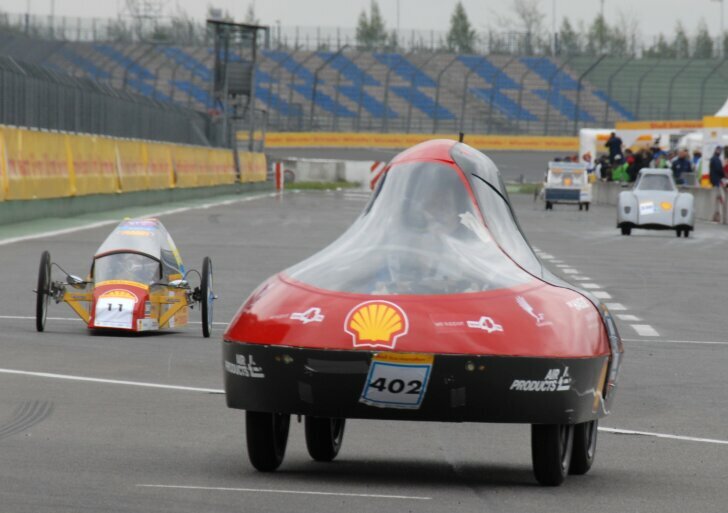 Compared to a traditional high speed race the atmosphere during Shell Eco-Marathon is much more relaxed. There is no rivalry amongst the competitors, just one common goal: saving fuel.